People who use their cell phones while driving really need to invest in a hands-free solution. You see accidents happen and narrowly avoided every day where the driver’s use of cell phones contributes to the cause. 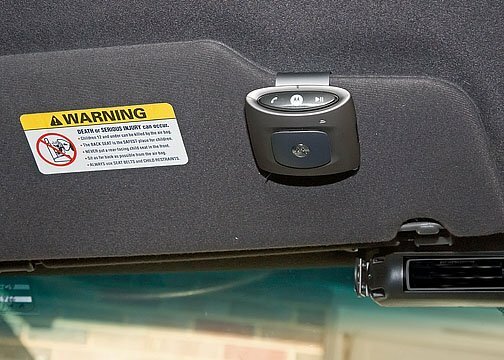 In some States, there are laws prohibiting drivers from using cell phones unless they have a hands-free solution making the need to have a hands-free solution all the more important. Bluetooth headsets are a popular option but not everyone is comfortable with wearing the earpieces. 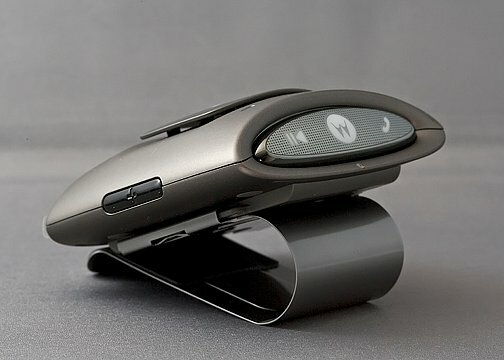 If you are one of those cell phone users, you really need to take a hard look at Motorola’s MOTOROKR T505 Bluetooth, in-car speakerphone ($99.95). Not only is it a quality speakerphone, it also is a FM transmitter to allow you to feed music from your Bluetooth enabled MP3 Player to your car’s stereo. 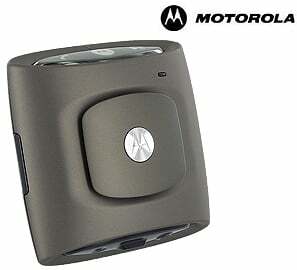 The Motorola T505 comes conservatively packaged with the speaker, travel charger and Quick Start Guide. The unit itself measures roughly three inches by three inches and is about an inch thick. I’d compare the size to a pack of playing cards. The T505 is light weight, coming in at 3.1 ounces and attaches to your visor via a detachable metal hook. The T505 has controls on every side of the unit. Power, FM transmitter buttons and the charging port are to the rear; volume keys are on either side; call and play/pause buttons are to the front. A lighted Motorola Symbol is on the front to confirm/alert users of various functions. Audible alerts/confirmations accompany the flashes of light as well. Once you charge the T505 and turn it on, it immediately goes into pairing mode. It took but a matter of seconds before my Samsung BlackJack II was paired and connected with the T505. The connection between the phone and T505 was strong. I could keep my phone in my belt case and have no problem maintaining a connection. The T505 fits discretely on your visor and the only concern I have with the control layout is that the power and FM transmitter buttons are not visible when the T505 is mounted to your visor. It doesn’t take long to remember the power button is to the left and the FM button is to the right but it would be nice to have them visible. Call quality on this speakerphone is very good. The speaker volume is loud and clear with no static or interference. The microphone picked up my voice without any issues when using a normal tone and volume. Background noises were filtered out considerably to minimize any distractions. The T505 comes packed with the standard features including muting a call, call waiting, voice dialing (phone dependant), rejecting a call, and last number redial. All of the functions listed are controlled through a series of taps, touches and presses of the Call Button. The Quick Start Guide does a good job of walking users through each function. One feature unique to the T505 is audible caller identification. On incoming calls, a female voice, with a hint of a British accent, will announce the number dialing in. The T505 speaks four languages (English, French, Spanish and Portuguese) and should you get tired of hearing your T505 talk to you, you can always disable this feature. As mentioned, you can connect the T505 to a Bluetooth enabled MP3 player or play tunes through your phone’s media player as long as the phone’s Bluetooth stereo supports A2DP. Tunes can be fed directly to the 2 watt speaker or transmitted via FM transmitter to your car’s stereo system. Once you pair your Bluetooth enabled MP3 Player with the T505, press and hold the FM Transmitter button (opposite of the power button) and the T505 will find the best FM Station to transmit over. The T505’s voice alert will announce which station to set your stereo to. Set your car stereo to that station and the music is fed through the car stereo. Should reception be weak with the first chosen station, simply tap the FM Transmitter and another station will be selected and announced. When an incoming call is received, the music is paused and when you hang up, the music resumes. Battery life is good, if not very good. Motorola reports standby time to be 14 days and talk time to be 18 hours. I would have expected running the FM transmitter would drain the battery at a faster rate but I couldn’t see any change in battery drain. To help conserve battery power, the t505 will shut down after being idle for 30 minutes and the FM transmitter will shut down after 10 minutes of inactivity. The T505 comes with a travel charger to help keep things charged on the road if needed. I was able to use the wall charger that came with a Motorola H680 (mini-USB) to charge the T505 and I would imagine that any mini-USB charger will juice the T505. This is one of the better speakerphones on the market. Doubling as a wireless speaker phone for your cell phone and a FM transmitter for your Bluetooth enabled MP3 Player puts the T505 in an exclusive class. From its discrete size to its commendable call quality, Motorola’s MOTOROKR T505 Bluetooth, in-car speakerphone ($99.95) should make everyone’s short list.